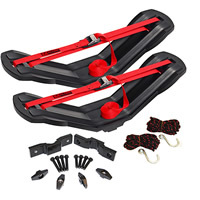 The Malone SeaWing car top kayak carrier is an inexpensive, effective way to cradle a kayak on top of your car. With its mid-mounting system, the SeaWing is the only bottom down kayak carrier that gives you enough space to place two kayaks on a factory installed roof rack. The deep flat channel and wide, flexible wings cradle a sit-on-top as effectively and gently as they do a touring or recreational kayak. The Malone SeaWing car top kayak carrier is the best deal we've found for transporting your boat. From Anonymous of hamburg, New Jersey on 9/3/2012 .